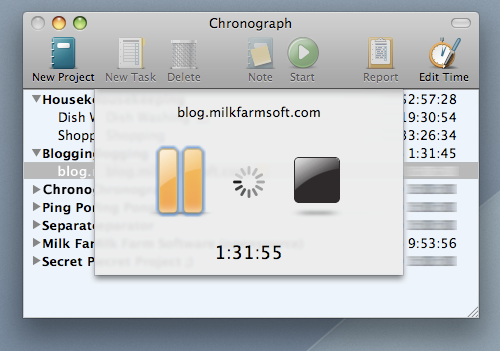 Chronograph is a Mac OS X time tracking application. List your projects, divide them into tasks and start the timer; it is as easy as that! With its intuitive interface, Chronograph makes time-tracking and reports-generation as unobtrusive as possible. There are many complex time-tracking applications available, but our goal is to keep process simple and streamlined, by starting with absolutely necessary set of features. Help you to track time spent on various tasks and projects and generate reports. ...... of features and gradually expanding it, without adding complexity. Qweas is providing links to Chronograph for Mac 1.3.2 as a courtesy, and makes no representations regarding Chronograph for Mac or any other applications or any information related thereto. Any questions, complaints or claims regarding this application Chronograph for Mac 1.3.2 must be directed to the appropriate software vendor. You may click the publisher link of Chronograph for Mac on the top of this page to get more details about the vendor.